Get it on with this orange-flavored retro rocker. Experience T-rextacy with the greasy grit of ‘70s London glam, or take it deeper and darker into Paranoid vintage metal grind. Dime the gain to experience the sludgelicious roar of contemporary stoner rock pumping through a Vintage 30®-style 4x12 cab. 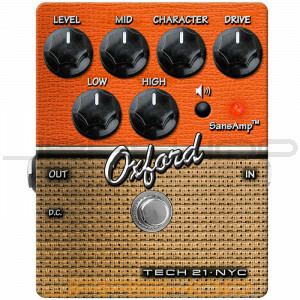 From sweet cleans to crushing distortion, the Oxford is one juicy pedal.